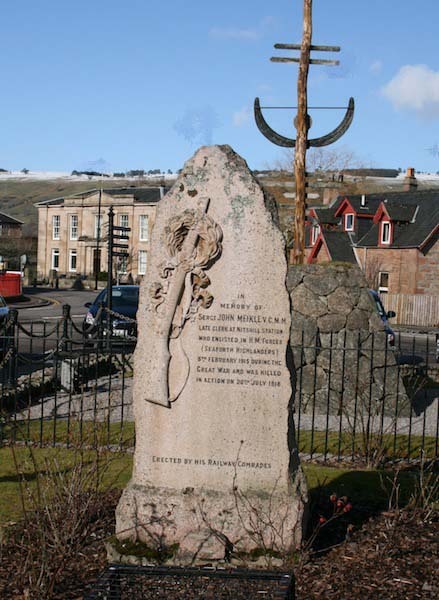 This Memorial is located in its own small, floral garden, next to the Seaforth Cambrai Monument in Station Square at Dingwall Railway Station. The picture also shows the Cambrai monument, a snow-clad Tulloch Hill behind Dingwall. On 20th July 1918 his Company was held up by machine-gun fire, near Marfaux, in France. With conspicious bravery, Sergeant Meikle rushed the machine-gun position, single-handed, and shot the crew of the two guns, emptying his revolver into them in the process. He despatched the remainder with a big stick, then stood up and waved his comrades on. Soon after that, another machine-gun position ?? the Company, causing heavy casualties in his platoon. Once again, he took the initiative by taking the rifle and bayonet of a casualty and rushed this gun crew as before, but was killed just as he got there. His bravery inspired two other Men to follow him and put the machine-gun out of action. The citation reads - 'this gallant Non-Commissioned Officer's valour, devotion to duty, and utter disregard for his personal safety, were an inspiring example to all. Sergeant Meikle was awarded the VC posthumously for his gallantry at Marfaux, during the 4th Seaforth advance along the River Ardre. The citation read: "For most conspicuous bravery and initiative when his Company, having been held up by machine gun fire, he rushed single handed a machine gun nest. He emptied his revolver into the crews of the two guns and put the remainder out of action with a heavy stick. Then, standing up, he waved his comrades on. Very shortly afterwards another hostile machine gun checked progress, and threatened also the success of the company on the right. Most of his platoon having become casualties, Sgt Meikle seized the rifle and bayonet of a fallen comrade, and again rushed forward against the gun crew, but was killed almost on the gun position. His bravery allowed two other men who followed him to put this gun out of action. This gallant non-commissioned officer's valour, devotion to duty, and utter disregard of personal safety was an inspiring example to all." (London Gazette 13/16 September 1918) Sergeant Meikleâ€™s father, Mr John Meikle, received the VC from General Sir FWN McCracken KCB, DSO, General Officer Commanding Scottish Command, at Maryhill Barracks, Glasgow on 28 October 1918.